When this album was released last year we somehow missed it in the pile, which is strange because listening to "When Do We Start Fighting" in its re-released format I recognize so many of the bands singles and album tracks. Then again, Seafood have done it the old fashioned way of tour supports and radio sessions which should set them in good stead for the future. The band have just signed to the Nettwerk label in America which helped Coldplay achieve a Gold disc for the "Parachutes" album. If this wasn't enough good news for the band, the hype machine is working over drive in the States and the all important New York show sold out in less than an hour. Its the sort of thing rock & roll dreams are made of!!! "When Do We Start Fighting" is the sort of album that you suddenly discover and wonder where have this band been all my life. Devoid of a saleable pre packed image and a lack of pretension the major music weekly's have avoided the band in favour of the larger than life American rockers, but this still hasn't stopped them selling over 20,000 copies through hardwork alone. The likes of "Splinter", "Western Battle" and "Cloaking" have that sort of energy that takes you back to those early gigging days where you ignored the bar in favour of maximum moshing each night. Backed up with a collection of demo's and session tracks in the form of the "Coursework" CD which will help you revise the whole Seafood sound. While not necessary to the listener its that little but of added value with a chance to hear the songs in their rawest forms. "Cloaking" for example in demo form is a little more restrained while "People Are Underestimated" is devoid of the dark electronica of the album version. 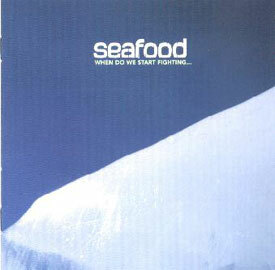 In a fit of generosity anyone who already owns the original album can buy the extra CD separately through the bands official website (www.seafood.uk.com). "When Do We Start Fighting" is an essential album in anyone's collection and a sign that both the States and the UK are tiring of the commercially viable but dull as ditch water adult orientated indie music.